BATMAN: MASK OF THE PHANTASM: A Legacy That Has Only Grown | Birth.Movies.Death. December of 1993 saw many classic films released in theatres; Tombstone, Schindler's List, In the Name of the Father, but Batman: Mask of the Phantasm likely wasn't on anyone's most anticipated list. Tim Burton's efforts to revive the superhero on the big screen in Batman and Batman Returns had resulted in stylish, entertaining fare, but neither had been really satisfying as a Batman film. The animated series, however, had been quite successful at distilling what makes Batman so fantastic into 20-minute segments. When Warner Bros. announced that they would be releasing an animated film in theatres in 1993, fans expected a solid-if-unspectacular piece of entertainment. What they got was, perhaps, the greatest account of the caped crusader. Yes, even better than The Dark Knight. Not willing to mess with the perfection of the animated series voice cast, the filmmakers brought back Kevin Conroy and Mark Hamill to reprise their roles as Batman and the Joker. Kevin Conroy brought nuance as both the philanthropist and the crusader by managing to de-age his voice for young Bruce and gradually wearing away the naivete and innocence as the film switches between past and present. Mark Hamill, likewise, flips the switch between amusing and disturbing so easily that it makes one wonder why kids were allowed to watch his version of the Joker in the first place. Hamill almost wasn't involved at all in Mask of the Phantasm. Fortunately for fans, Alan Burnett's wish to keep the more infamous members of the rogue's gallery out of the film didn't hold up; if it did, this cult favorite might have never garnered the following that came years later. Fans didn't quite turn out for the film like Warner Bros. thought they might during Christmas of 1993. The film's total run lasted about 48 days and took in less than $6 million. Mask of the Phantasm turns 25 this month and, despite its relative failure at the box-office, the film has lived on and built a cult following. As constructed, few Batman films could compete with this one. Marrying the style of noir with the futuristic metropolis that Bruce Wayne hopes Gotham can be, the animation is gorgeous. Each frame is a visual marvel. As the camera plunged between the many towers that make up the Gotham skyline, viewers sensed that this wasn't going to be just an extended episode of the animated series. This felt different. Mask of the Phantasm felt bigger, more dangerous. The script, by Alan Burnett, starts with a masked vigilante killing mob bosses systematically. The animated series was never short on crime, but when the film opened with the murder of a gangster, it was obvious that the stakes had been raised. Similar in appearance to Batman, the assailant known as "the Phantasm" turns the city against its one-time hero. Already confronting the return of a lost love and the legacy of his parents looming over him, Bruce has never been more disenchanted. There was always an uneasy truce between Batman and Gotham P.D., but once crime bosses start dying, the gloves come off, and Batman finds himself outrunning a hail of gunfire. Fearing for his life, it's likely the first time that audiences had seen Batman afraid of anything. Gotham doesn't seem to need or even want Batman anymore, so why continue? Much has been written and said about Batman's everlasting crusade against the criminal underworld, but it goes unsaid how much viewers relate to Bruce's frailty. Bruce's pledge to don the cape and cowl is less a thrill-seeking expedition than a tragedy unfolding each night. One sequence, in particular, hit me harder than any of the live-action films. Kneeling at his parents' grace, Bruce pleads with his parents to release him of his vow. "It doesn't mean I don't care anymore. I don't want to let you down, honest, but... but it just doesn't hurt so bad anymore. You can understand that, can't you? Look, I can give money to the city - they can hire more cops. Let someone else take the risk, but it's different now!" Each rumble of thunder and flash of lightning interjecting his speech acts as a spectral rejection that Bruce cannot bear. He lowers his forehead to the granite headstone, "I didn't count on being happy." Rarely had a comic book character seemed so operatic. Most Batman stories ignore that Bruce left behind happiness once he became Gotham's protector. The crusade that Bruce took up may be moral, but it would never bring him any sense of satisfaction. Paul Dini intended for these scenes to reinforce that Bruce's hopes for a better life "have a tendency to get worse when [he hopes] things will get better." This somber realization is hammered home when Bruce puts on the mask for the first time, just after Andrea (a brilliant Dana Delaney, still the best female character in a Batman movie) breaks off their engagement. Alfred, the man who raised Bruce from birth, recoils in horror as he watches Bruce consumed entirely by his vengeance in the form of Batman. Animated films can bridge the gap between what a live-action film can't do and what possibilities are offered by a one-off. Unbound by any ties to future sequels, Mask of the Phantasm is allowed to breathe, to operate at its own pace and satisfactorily conclude without unnecessary plot stuffing at 76 minutes. In doing so, Mask of the Phantasm allows for a theatrical character study of Bruce Wayne/Batman that wouldn't be available in live-action until Christopher Nolan's Batman Begins. 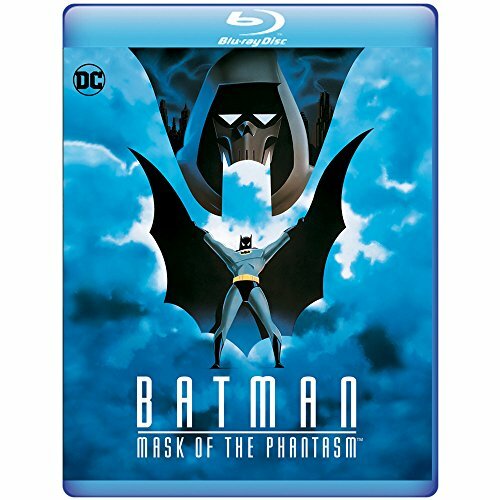 The film just received a blu-ray release last November and fans discovered that, by not being asked to do everything, Mask of the Phantasm was able to surpass expectations. It's a work of brilliance that is finally receiving the recognition it deserved 25 years ago.